Our product range includes a wide range of roller turn table. Designed to change the direction of pallet travel by rotation of the pallet through any angle from 90° up to 180°, whilst keeping the relationship of the pallet runners to roller conveyor the same. Range of heights available from 400mm - 1150mm top of roller. 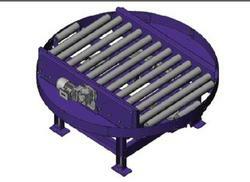 Motors available - roller conveyor 0.37 kW (12 metres per minute), roller conveyor 0.55 kW (18 metres per minute). Pallet size - 800 / 1000mm leading edge on rollers x 1200mm long. Two rotation speeds available - rotation drive 0.18kW (2rpm), rotation drive 0.37kW (4rpm). Looking for Roller Turn Table ?